pressure-treated lumber, including ACQ, Micronized Copper, CCA, CBA, and CA, and has a lifetime guarantee. A conventional screw allows molten material to extrude from under the head creating an unsightly "mushroom." Phillips II Plus has a patented composite thread configuration that pulls the molten material into the hole, reducing the mushroom effect and sealing the hole as it drives. Phillips II Plus Composite Screws have passed AC257 testing by an ICC-accredited laboratory. Tested to exposure condition 4 (the most severe category of this test). Phillips II Plus Composite Screws are available in six colors. All colors come in a 5-pound reusable plastic container with a #2 ACR Square Bit. Be sure to read the installation instructions before starting your project. Approved by Trex®. To color match your lumber, please use our screw-to-wood color guide. © 2019. All rights reserved. Phillips Fasteners, LLC, Holyoke, MA 01040 U.S.A. There are improvements in wood-preserving technology. They are in response to a growing market demand for less toxic, more environmentally acceptable preservatives for wood. These new treatments include ACQ and Micronized Copper. ACQ stands for Alkaline Copper Quat. The central ingredient is 100% recycled copper. Alkaline is a natural base, and quat is a fungicide that attacks decay organisms. Micronized Copper treatments utilize copper but in micro-sized particles. Phillips Fastener is pleased to announce all of the Phillips II Plus Wood Screws and Phillips II Plus Composite Screws are formulated to work with all types of pressure-treated lumber. All three colors – red, tan, and green – can be used. Phillips II Plus Wood Screws and Phillips II Plus Composite Screws have passed AC257 testing by an ICC-accredited laboratory. Tested to exposure condition 4 (the most severe category of this test). Phillips Fastener screws are made of high quality hardened steel and are coated with our proprietary barrier coating. The coating is designed to last for the lifetime of your project and will offer corrosion resistance equal to or better than hot-dipped, galvanized nails. The screws are not intended to last longer than the life expectancy of your wood. The reuse of screws is not recommended and will void any guarantee. Phillips Fasteners’ Stainless steel is recommended for coastal and water areas. Phillips Fastener coating will not prevent staining, streaking or extractive bleeding related to high tannin content lumber such as cedar, redwood and cypress. Properly treating and sealing the lumber in accordance with the manufacturer’s recommendations is required. Unless otherwise specified as structural screws, screws are not designed for use in metal hangers, railing supports or for structural applications. Consult your building code and your board manufacturer’s recommendation for proper fasteners and fastening methods. Note: NOT all screws made by Phillips Fastener are guaranteed. Refer to each product for their feature and benefits including corrosion resistance. 8' x 8' = 3 lbs. 8' x 12' = 5 lbs. 12' x 12' = 6 lbs. 12' x 16' = 8 lbs. Edge Test Samples: Before beginning your construction, perform some tests on scrap composite. Depending upon the composite used, the installation temperature, and the age of the board, composite screws will perform differently. On test samples, install screws close to the end of the board to check for cracking. Cracking may occur in cold weather, in very dense boards, or in boards that have aged substantially. If you are unable to make your screw connections far enough in from the end of the board to avoid cracking, it may be necessary to pre-drill the board end holes. Technique: Before beginning your project, develop a proper technique of installation. Phillips' composite thread configuration will pull the displaced melted composite into the screw hole as you drive it in. Try various driving speeds and note the results. Also develop a proper depth to which you will sink the head. 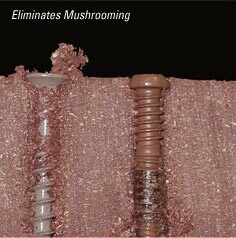 In most popular composites, pre-drilling is not necessary; however, if some mushrooming still occurs, pre-drilling with a 1/8" bit will guarantee a flush surrounding surface. Each composite wood reacts differently, so a little practice will make the outcome better.